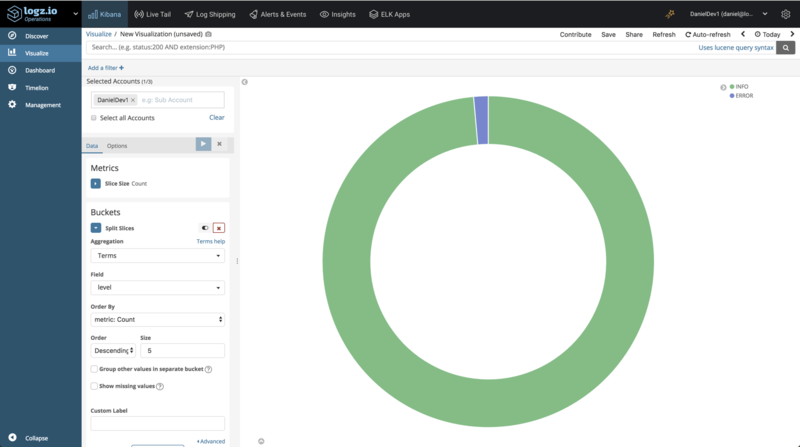 Kafka and the ELK Stack — usually these two are part of the same architectural solution, Kafka acting as a buffer in front of Logstash to ensure resiliency. 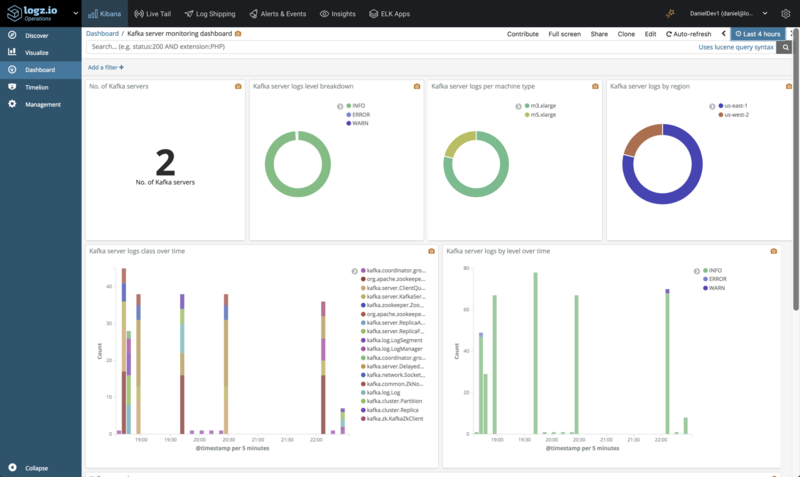 This article explores a different combination — using the ELK Stack to collect and analyze Kafka logs. As explained in a previous post, Kafka plays a key role in our architecture. As such, we’ve constructed a monitoring system to ensure data is flowing through the pipelines as expected. Key performance metrics, such as latency and lag, are closely monitored using a variety of processes and tools. Another element in this monitoring system is Kafka logs. Kafka generated multiple types of log files, but we’ve found the server logs to be of particular use. We collect these logs using Filebeat, add metadata fields, and apply parsing configurations to parse out the log level and Java class. 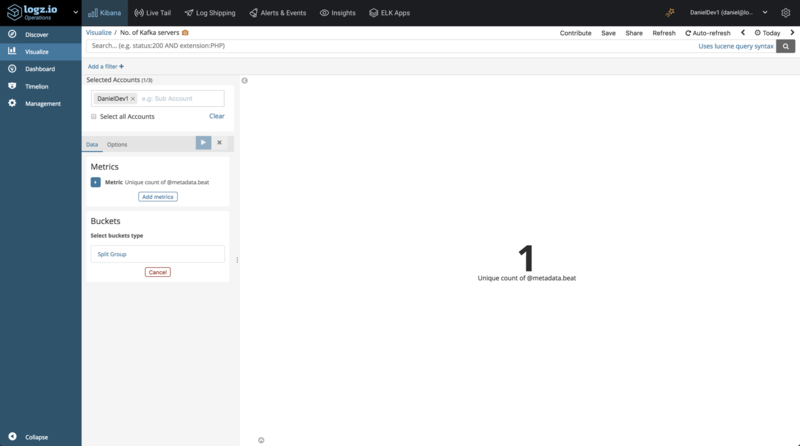 In this article, I’ll provide the instructions required to hook up your Kafka servers to the ELK Stack or Logz.io so you can set up your own logging system for Kafka. The first few steps explain how to install Kafka and test it to generate some sample server logs, but if you already have Kafka up and running simply skip to the next steps that involve installing the ELK Stack and setting up the pipeline. Congrats, you have Kafka up and running, and listening on port 9092. Let’s take Kafka for a simple test run. Now that we have made sure are publish/subscribe mechanism is up, let’s install the components for logging it — Elasticsearch, Kibana and Filebeat. I will describe two methods for shipping the Kafka logs into the ELK Stack — one if you’re using Logz.io, the other for shipping them into your own ELK deployment. To ship the data into Logz.io, some tweaks are required in the Filebeat configuration file. Since our listeners handle parsing, there’s no need for using Logstash in this case. Your Logz.io account token can be retrieved from the General settings page in Logz.io (click the cogwheel at the top-right corner). Be sure to use kafka_server as the log type to apply automatic parsing. I recommend verifying the YAML before starting Filebeat. You can use this online tool. Or, you can use the Filebeat wizard to generate the YAML file automatically (available in the Filebeat section, under Log Shipping in the UI). 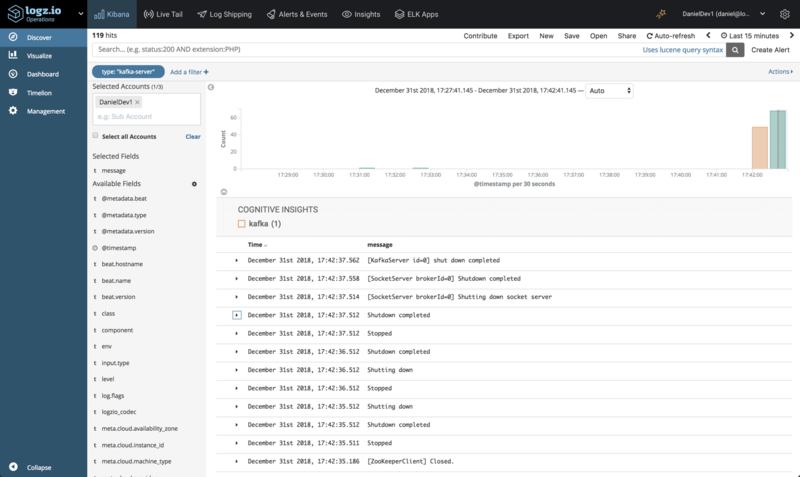 To ship Kafka server logs into your own ELK, you can use the Kafka Filebeat module. 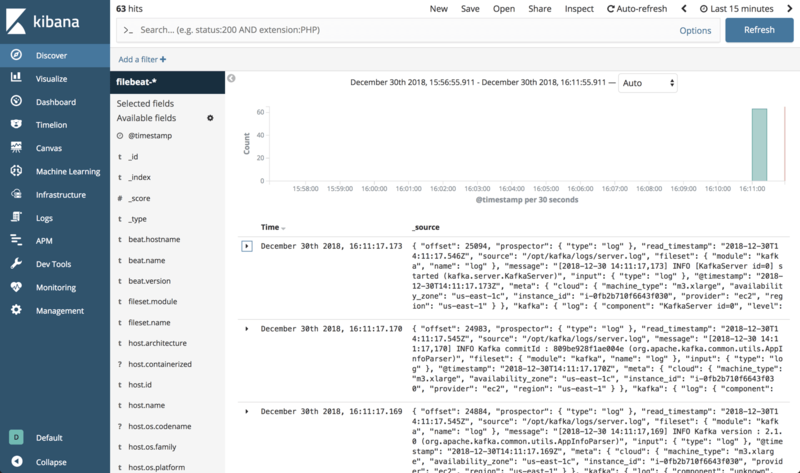 The module collects the data, parses it and defines the Elasticsearch index pattern in Kibana. sudo vim /etc/filebeat/modules.d/kafka.yml.disabled - module: kafka log: enabled: true #var.kafka_home: var.paths: - "/opt/kafka/logs/server.log"
So – what are we looking for? What can be done with the Kafka server logs? The parsing applied to the logs parses out some important fields — specifically, the log level and the Kafka class and log component generating the log. 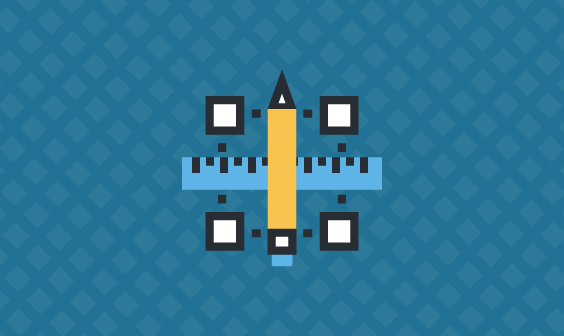 We can use these fields to monitor and troubleshoot Kafka in a variety of ways. For the sake of demonstration I’ve only set up one Kafla server, but we can see the logs are already starting to pile up. 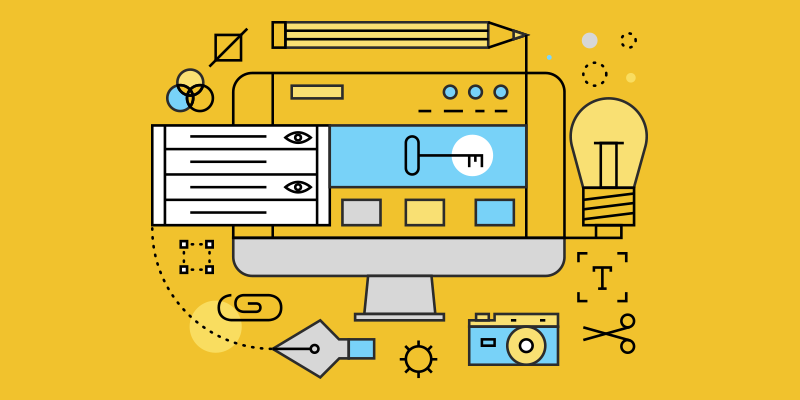 Finding the needle in the haystack is one of the biggest challenges Kafka operators face, and for that reason, Logz.io’s Cognitive Insights can come in handy. Cognitive Insights combines machine learning and crowdsourcing to correlate between log data and discussions in technical forums on the web. As a result of this correlation, critical events that may have gone unnoticed are flagged and marked for us in Kibana. As seen in the example below, an error log was identified by Cognitive Insights, and opening it reveals some additional information on how to troubleshoot it, including links to the technical forums where it was discussed. Just like any other component in your stack, Kafka should be logged and monitored. 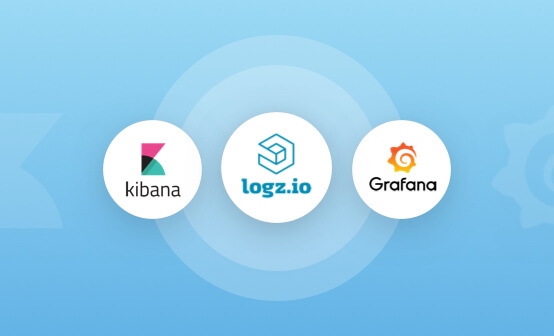 At Logz.io, we use a multi-tiered monitoring system that includes metrics and logs for making sure our data pipelines are functioning as expected. 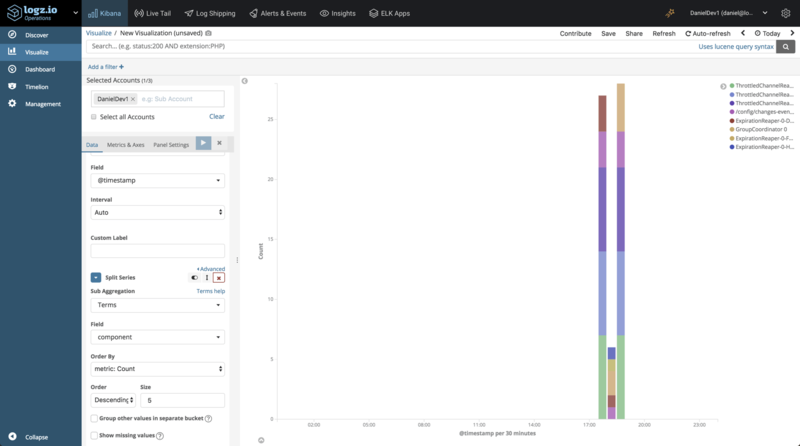 As mentioned already, Kafka server logs are only one type of logs that Kafka generates, so you might want to explore shipping the other types into ELK for analysis. Either way, ELK is a powerful analysis tool to have on your side in times of trouble. 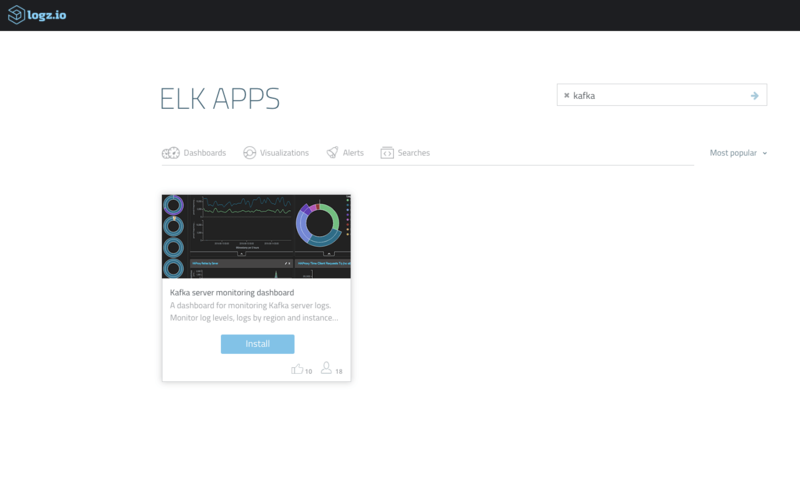 The dashboard above is available for use in ELK Apps — Logz.io’s library of dashboards and visualizations. To deploy it, simply open ELK Apps and search for “Kafka”. 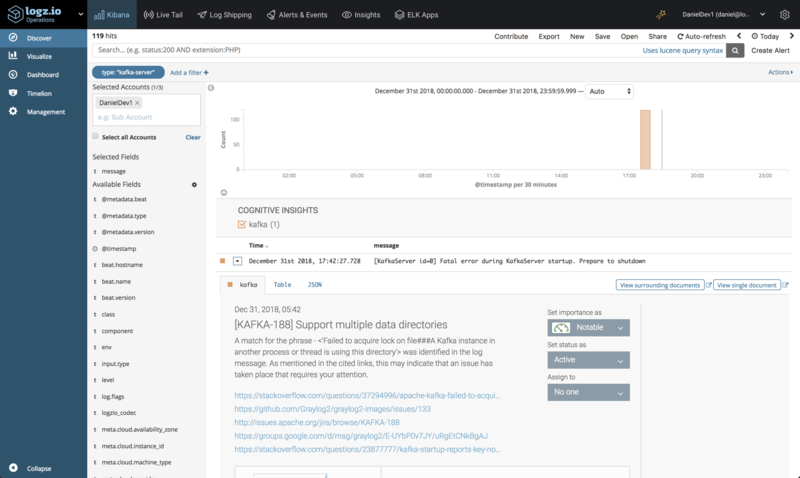 Easily monitor your Kafka instances with Logz.io's ELK Apps.